My dear friend Arun made a great point the other day. When we were talking about blogging and using Twitter, she said something along the lines of: You always told me about new types of gum and candy, so why are you not writing about it in your blog? Arun is right to question why I have been excluding my hobby of searching for new edibles. I guess I can write about my findings after all. I cannot be sure when or why this hobby came along. Every time I am in a store that sells gum, snacks, candy, dried fruit, or any other fun tasty-looking stuff, I stop at the counter and search for something I have not seen or tasted before. If I hear about something I think may taste good, I will employ the web and go from store to store until I find it. Nice bloggers, like the author of Candy Blog, kindly inform my interest in sweets. This hobby of mine, can be distracting on trips when I spend extra time lingering at all the small kiosks. It can also be annoying to people who are with me because I do like to make sure I see everything! Not many people like to go grocery shopping with me because they know, for me, it is a fun time to look around! 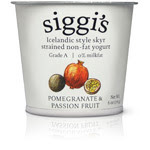 One of the latest things I have finally found and tried was Siggi's skyr. So far, my favorite flavor is Pomegranate and Passion Fruit. The Orange and Ginger flavor is also very good. I am looking forward to finding the Acai kind soon! I read about this Icelandic yogurt a long time ago, but had to wait until it arrived at the West Coast stores. Had I visited the East side of the US, I would have been sure to look for it. Yes, this hobby is something I am passionate about!